Ramon Lopez, a professor of physics at The University of Texas at Arlington, has been named to the UT System Academy of Distinguished Teachers for his excellence in teaching and mentoring students. He is one of only two candidates selected from across the UT System to join the distinguished body of educators this year. 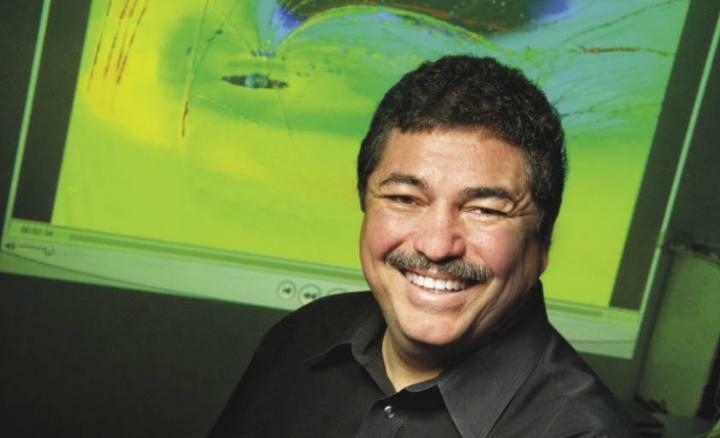 Lopez is an esteemed space physicist and a passionate advocate for enhancing the quality of K-12 science education and increasing diversity in science, technology, engineering and mathematics, or STEM, fields. He will be inducted into the Academy during an April ceremony in Austin. Lopez becomes the third College of Science faculty member inducted into the prestigious Academy in its seven-year history, joining Kevin Schug and Barbara Shipman, who were both inducted in 2016. Other UTA faculty members in the UT System Academy of Distinguished Teachers include English Professor Kenneth Roemer and Mary Lynn Crow from the College of Education. Lopez is a co-director of UTA’s UTeach Arlington initiative, a highly successful secondary science and mathematics teacher preparatory program, which enables students to earn a science or math degree along with a teaching certification within a four-year period. The UT System Academy of Distinguished Teachers is the latest recognition of Lopez’s extraordinary impact in science education at the K-12 and collegiate levels. In 2018 he was inducted into the UTA Academy of Distinguished Teachers and also received the Hispanic Engineer National Achievement Awards Conference Education Award from Great Minds in STEM, a nonprofit organization that promotes STEM careers, especially in underserved communities. In 2017, Lopez received the UT System Regents’ Outstanding Teaching Award and the UTA Award for Excellence in Doctoral Mentoring, and was elected a fellow of the American Association of Physics Teachers for his contributions to physics education. He won the American Geophysical Union’s 2016 Space Physics and Aeronomy Richard Carrington Award, which honors recipients’ significant impact on the understanding of science by students and the public. He was the 2012 recipient of the APS Edward A. Bouchet Award, which seeks to promote the participation of underrepresented minorities in physics by identifying and recognizing a distinguished minority physicist who has made significant contributions to physics research. He also received the Society for the Advancement of Chicanos/Hispanics and Native Americans in Science Distinguished Scientist Award in 2010, given to members for their dedication to science, education and mentoring and for their willingness to serve as role models for the next generation of minority scientists. In 2002, Lopez received the APS Dwight Nicholson Medal for Outreach, which honors humanitarian service. Lopez has consulted with school districts and education agencies across the country to improve standards in science education. In December 2018 he was named chair of the Science Academic Advisory Committee for the College Board, and will serve a two-year term. From 2010-13, he co-chaired the writing team that produced the Next Generation Science Standards, which provides content standards for K-12 science educators. He also was a member of the National Research Council’s Committee on Undergraduate Science Education from 2002-04, and from 2006-09 he was a member of the writing team for the College Board’s first-ever Science Standards for College Success, coauthoring the physical science standards. He has also received millions of dollars in research funding from sources including the National Science Foundation and NASA. His research interests are primarily in magnetospheric physics and space weather, as well as solar wind variations and what that shows about solar activity. Lopez also conducts research in physics education and has graduated three physics doctoral students from UTA whose research concerned teaching and learning, we well as applied cognitive science. In addition to the American Association of Physics Teachers, he is a fellow of the American Physical Society and the American Association for the Advancement of Science. Lopez earned a doctorate in space physics from Rice University in 1986. Prior to joining UTA, he worked as a research scientist and administrator at the University of Maryland at College Park, as director of Education and Outreach Programs with the American Physical Society, as professor and physics department chair at UT El Paso and as physics professor at the Florida Institute of Technology. He joined the UTA department of Physics in 2007.